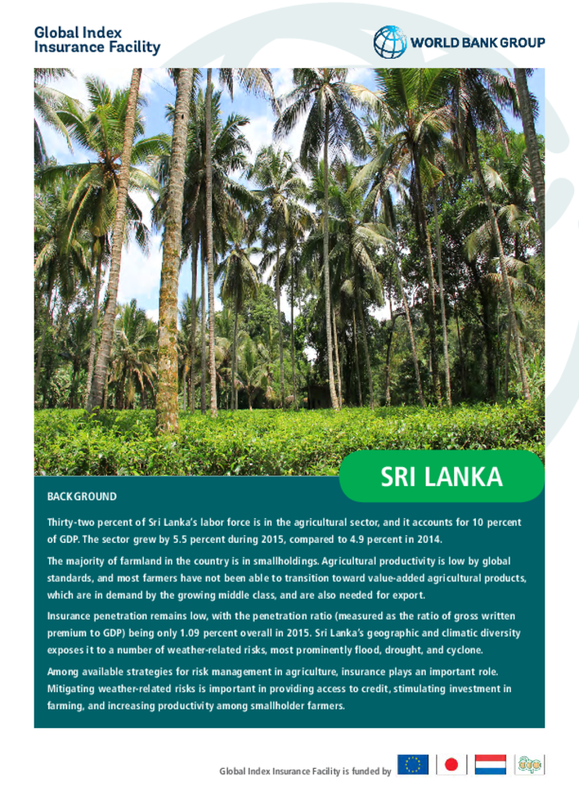 In 2011, the World Bank Group and Partner Sanasa Insurance Company Ltd. (SICL), supported by the Global Index Insurance Facility (GIIF), started working on stimulating the weather-related index insurance market in Sri Lanka through a combination of capacity building and awareness raising activities at both the institutional and the smallholder farmer levels. Thirty-two percent of Sri Lanka’s labor force is in the agricultural sector, and it accounts for 10 percent of GDP. The sector grew by 5.5 percent during 2015, compared to 4.9 percent in 2014. The majority of farmland in the country is in smallholdings. Agricultural productivity is low by global standards, and most farmers have not been able to transition toward value-added agricultural products, which are in demand by the growing middle class, and are also needed for export. Insurance penetration remains low, with the penetration ratio (measured as the ratio of gross written premium to GDP) being only 1.09 percent overall in 2015. Sri Lanka’s geographic and climatic diversity exposes it to a number of weather-related risks, most prominently flood, drought, and cyclone. Among available strategies for risk management in agriculture, insurance plays an important role. Mitigating weather-related risks is important in providing access to credit, stimulating investment in farming, and increasing productivity among smallholder farmers. Since 2011, the Sanasa Insurance Company Ltd. (SICL), with the support of GIIF, has designed simple, flexible, and affordable weather-index insurance products for paddy and tea farmers. The project has since assisted SICL in developing its institutional capacity and its agents, while raising awareness of the benefits of index insurance products among more than 50,000 farmers. SICL has more than 250,000 microinsurance clients. Index insurance is a new business line for the company, and an area of potential growth. The high cost of premiums has inhibited sales of weather-index products to paddy farmers. SICL plans to modify the product design to reduce premium costs. Premium subsidies are also being explored as a possible means to reduce costs and expand the market. Lack of awareness: Smallholder farmers are often confused about the differences between traditional indemnity insurance and index insurance. A strong mass media awareness campaign, designed to increase understanding of weather-index insurance, is needed in order to promote sales. Data: Availability of accurate and affordable data to facilitate good, effective product design is needed. There have been difficulties obtaining rainfall data in a timely manner from the meteorological department. This has been a major challenge for the successful operation of weather-index insurance in Sri Lanka.